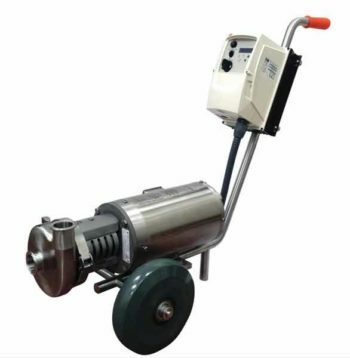 Ampco Pumps stainless steel pumps have been in use in dairy and food processing plants since 1957 when a Z series flanged unit was installed in a first generation CIPs system. The initial acceptance of these units, based on reliability and outstanding performance, encouraged Ampco to offer sanitary connections. In the mid-eighties, Ampco developed the D series, designed principally for CIP and COP applications. In 1996, Ampco introduced a new line of sanitary stainless steel pumps for the dairy, food, beverage and pharmaceutical industries. The M series design is based on the same qualities which have made the D series so successful – efficient performance, quiet operation and low maintenance. The MC3 Series, introduced in 2004, includes two new models and an improved seal design with a clamped-in silicon carbide seat. M series pumps, are in conformance with 3-A Sanitary Standards for Centrifugal Pumps for Milk and Milk Products ( Number 02-09). Today’s design of both the D series and M series provides for a smooth conversion of velocity energy to pressure energy which minimizes secondary flow inside the pump. The double curvature impeller blade design, where applicable, increases the pump’s efficiency and suction capability resulting in pump performance unsurpassed in this service. We are the leader in selling top quality pumps for commercial, industrial and marine uses. From metallurgy and corrosion resistance to demanding sealing requirements, customers have come to depend on Ampco Pumps for solutions to difficult pump applications.